I first caught wind of writer/director Joel Potrykus with his feature debut Ape (trailer) which, at the time of its release in 2012, won him a number of accolades including Best New Director at Locarno. He's made a few other movies in the intervening years but his latest is the first that has caught my attention enough to warrant me making an effort to see it. Relaxer unfolds over the last few months of 1999, just as the impending Y2K fever is hitting its peak. Potrykus regular Joshua Burge stars as Abbie, a guy obsessed with challenges; reading about them, watching them and doing his own. Problem is, he's never finished an issued challenge. The movie opens mid-challenge with Abbie trying to drink milk while his best friend, and maybe roommate, Cam (David Dastmalchian), is issuing directions and video taping the proceedings. After yet another failed attempt, Cam, angry and disappointed, issues the ultimate challenge: beat level 256 of Pac-Man and don't get off the couch until you do it. So begins the drama of Relaxer which, for most of its running time, comprises of Abbie never moving from his position on the couch, doing stuff, on his own. At first a few people come and go but after a while it's just Abbie and the challenge and the challenge of doing the challenge and it's a challenge to watch. Until it's not. Partway through, about the time that Abbie is left completely alone, Relaxer starts to grate, but with 40 minutes already invested, it seems like a waste of time to call it quits. Plus, honestly? I wanted to see how it would end. That's part of the draw of the movie: it's like watching an accident and just waiting for it to get ugly and then when it does, watching a little longer to see just how much worse it gets. And it does get pretty bad but Abbie's determination (and desperation) is also really funny, in a sad, pathetic sort of way. Burge is perfectly cast. His gaunt face and paltry physique lend themselves to the character but more than that, it's the determination in his eyes that really propels the movie forward and his performance is compelling. 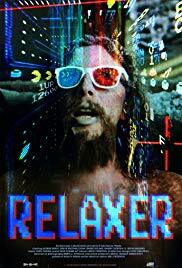 The entire time I was watching Relaxer, I was wondering who this movie was made for. It's gross, ugly to look at, you can almost feel the grime of the room through the lens, and really kind of pointless but also oddly compelling.